Dr. Manning and Dr. Wayne provide Botox services and Dr. Wayne provides fillers. BOTOX¨ Cosmetic is a simple, nonsurgical, physician-administered treatment that can temporarily smooth moderate to severe frown lines between the brows in people from 18 to 65 years of age. It is approved by the Food and Drug Administration (FDA). One 10-minute treatment-a few tiny injections-and within days there’s a noticeable improvement in moderate to severe frown lines between the brows, which can last up to 4 months. Results may vary. Laser Genesis skin therapy is an innovative, technologicaly advanced way to promote vibrant and healthy looking skin in men and women. This non-invasive procedure treats conditions that are associated with premature signs of aging and sun damage, such as excessive redness, large pores, uneven texture, and fine lines. The Laser Genesis procedure has been scientifically proven to produce new collagen. Additionally, this therapy can diminish the appearance of scars. Treatments can be performed in a relaxed, comfortable manner without the use of topical anesthetics or gel. JUVEDERM is the only hyaluronic acid filller with FDA approval to last up to one year. JUVEDERM injectable gel is a “next-generation” smooth consistency gel dermal filler that helps to instantly restore your skin’s volume and smooth away facial wrinkles and folds like your “smile lines” or “parentheses” (nasolabial folds-the creases that run from the bottom of your nose to the corners of your mouth). With RADIESSE wrinkle filler, you welcome back your own natural collagen to smooth out the signs of aging. That’s because RADIESSE wrinkle filler’s unique formulation stimulates collagenesis – the production of new collagen – which results in increased volume for natural looking wrinkle correction that may last a year or more in many patients. Restylane¨ uses hyaluronic acid to replace lost volume and restore youthful contours to smooth away moderate to severe facial wrinkles and folds, such as the lines from the corners of your mouth (nasolabial folds). Sculptra Aesthetic helps correct shallow to deep facial wrinkles and folds. 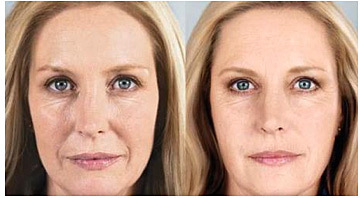 Sculptra Aesthetic targets the underlying causes of the signs of facial aging. It begins to work within the deep dermis, where your skin’s structure is reinforced as Sculptra Aesthetic helps to replace lost collagen. This reinforced collagen structure provides a foundation that gradually restores the look of fullness of your shallow to deep facial wrinkles and folds that have depleted over time. The result? Sculptra Aesthetic is different because it works gradually, producing a more natural looking appearance that can last up to two years. If you want a more youthful looking appearance without looking like you’ve had work done, then Sculptra Aesthetic may be the right choice for you. to provide protection against free radicals – the #1 cause of premature skin aging. As we age, the concentration of natural antioxidants in our body declines and free radical concentration increases. As a result, damage accumulates in skin cells every day. To help repair existing damage and help prevent future signs of skin aging, apply Revaléskin® antioxidant products daily for younger looking skin. In 2005 Jan Marini Skin Research revolutionized eyelash enhancement with a technological first that inspired a host of imitators. No other lash product on the market can use both of the enhancing peptides found in our Marini Lash Conditioner. Now you can enjoy amazingly gorgeous, dense and lush eyelashes, the eyelashes of your dreams from Jan Marini Skin Research. Designed specifically for professional use, the Clarisonic PRO Sonic Skin Cleansing System is only available for use and sale by skin care professionals.